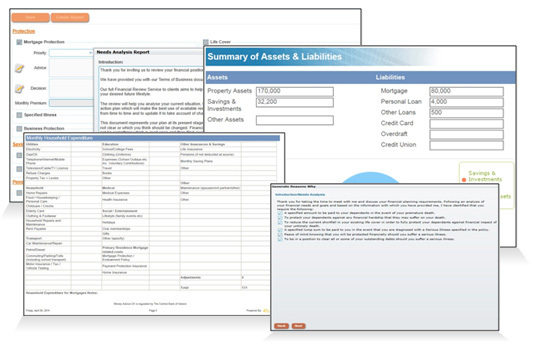 Software Platform For Financial And Mortgage Brokers, Wealth Managers and Financial Planners. Managed and developed by experienced financial services professionals the software is the product of more than 20 years experience building software for the broker industry in Ireland. The application is designed to manage the end to end office requirements of big or small firms including marketing, sales, advice including full needs analysis, cash flow projections, compliance, comprehensive product library, pipeline and commissions management. Full Client Relationship Management is also included. Clients and policy details are updated and maintained from the following insurers; Aviva, Aviva Health, BCP Asset Management, Friends First, Irish Life, New Ireland, Royal London, Standard Life. Life Protection quotes also provided from all insurers. Money Advice +CRM provides all the software needs of brokers in one package. Auto calculators within the software quickly establish client shortfalls and produce personalised client financial reports. The user can submit applications direct to Irish Life via its B-Line application software. Provide home insurance quotations and place this business on line with Zurich General (contact support to set up). 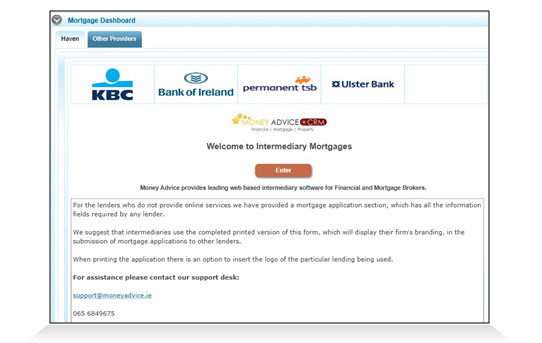 Money Advice +CRM provides state of the art, fully integrated mortgage solution software free to all its users. As professional advisors you will expect that a mortgage software package has access to the whole of the mortgage market and that the data is updated on a regular basis. Our mortgage software solution provides exactly this. 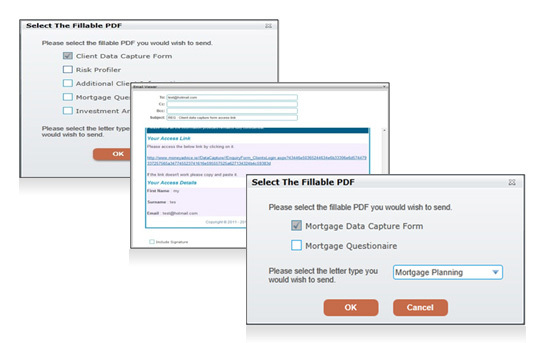 Our mortgage analysis solution is integrated into our CRM and as such, data need not be keyed twice. Advisors are able to select from a range of comprehensive filters to produce a highly defined series of mortgage results which can instantly be saved as evidence of research against the client. Money Advice +CRM provides a capacity to generate all the letter template a broker's office would use. 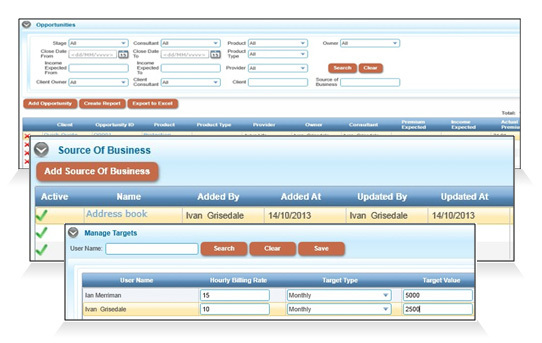 The client financial cash flow planner can also be completed within MoneyAdvice +CRM by the advisor using a unique wizard reducing the time taken to enter client data. Customers of Money Advice +CRM, who also have access to Fund Focus, can upload client model portfolios directly into Fund Focus where users can analyse the portfolio's overall risk and performance. A mobile version of the Money Advice quotation service is available ensuring you have access to the quotations even on the move. While never easy to satisfy the needs of a retail financial services provider, Philip has brought his own experience as a Financial Services Broker and built a robust CRM system which enables us to meet our needs in terms of compliance, sales and ongoing servicing of our customers. With the back-up and expertise of a consistent and committed team, he has continuously improved and invested in 'Money Advice' and the fruits of this are there to be seen. Being an experienced user of CRM systems, Money Advice staff made it an easy transition for us to Money Advice +CRM in 2013. The Money Advice team facilitated the transfer of information and we had the added benefit of data feed updates from all the companies on Money Advice; the current policy information is of enormous benefit to both the administration team and especially the sales consultants. The system is innovative, practical and user friendly. As with all new systems, it takes avid use to get the most from the software. It has an enormous compliment of well thought out features which has improved our sales and compliance processes. From a management point of view, the reporting facilities are second to none. Philip and his support and development team are a pleasure to work with and their quick responsive support to queries or technical support requests commendable. With constant ongoing development, this industry driven software is forever evolving and improving and we look forward to continuing to grow our business with this system as the back bone to our productivity. DFP Pension & Investment Consultants have been customers of Money Advice since 2012 and have found the staff and system to be of the very highest quality. The reason I initially chose Broker CRM, as it was called then, had nothing to do with my understanding of CRM systems but that I was impressed with Philip’s passion for the system and I knew him when I was a young fella in Ennis. I still don’t know much about CRM but I’m sure glad DFP partnered with Money Advice in 2012. We moved to Money Advice as we were using a separate CRM system and software for quoting and doing protection and pension quotations and we wanted one system which could do this as well as log all phone calls, tasks etc. The staff at Money Advice were excellent in facilitating the export of client data and logs from our old CRM system to Money Advice. I took the free trial period and having tested it out myself was convinced of the merits of the system.